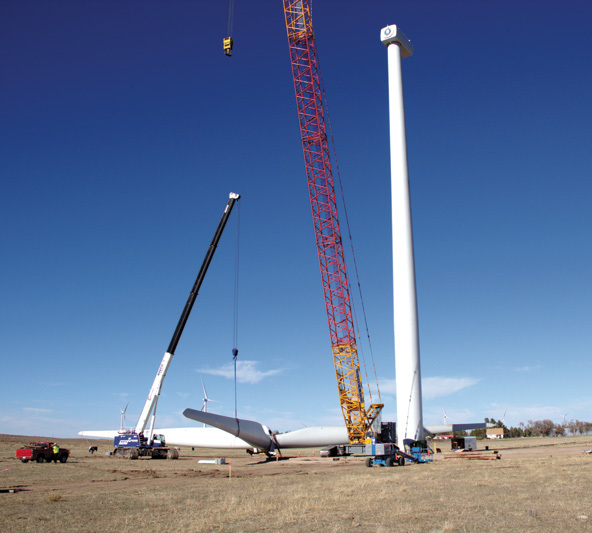 Advanced planning certainlypaid off for Alliance Power Inc., whose Colorado Highlands wind project was ready to go when Tri-State Generation and Transmission needed a wind project developer to hitthe ground running. It's an axiom in business-and it's perhaps especially true for the wind power development business-that planning pays off. That was clear with the Colorado Highlands Wind project, whose developers had already done upwards of five years of planning, including having an interconnection agreement in place, which allowed the project to stand out from competitors in a Request for Proposals competition. Having that interconnection agreement was one of the main reasons the developer, owner, and operator of Colorado Highlands, Alliance Power Inc., was able to secure a 67-MW power purchase agreement (PPA) for the project with Tri-State Generation and Transmission Association, headquartered in Westminster, Colorado. The original project was followed by a 24-MW expansion less than a year later. Colorado Highlands is just the latest move into renewable energy for Tri-State, a not-for-profit wholesale power provider that serves 44 rural electric cooperatives in four states: Colorado, Nebraska, New Mexico, and Wyoming. The association collectively serves approximately 1.5 million customers across a 200,000 square mile service territory. Like many large power companies and co-ops in the western U.S., a good deal of Tri-State's generating capacity currently comes from coal-fired generating plants. But renewable power is of increasing focus for the cooperative utility. 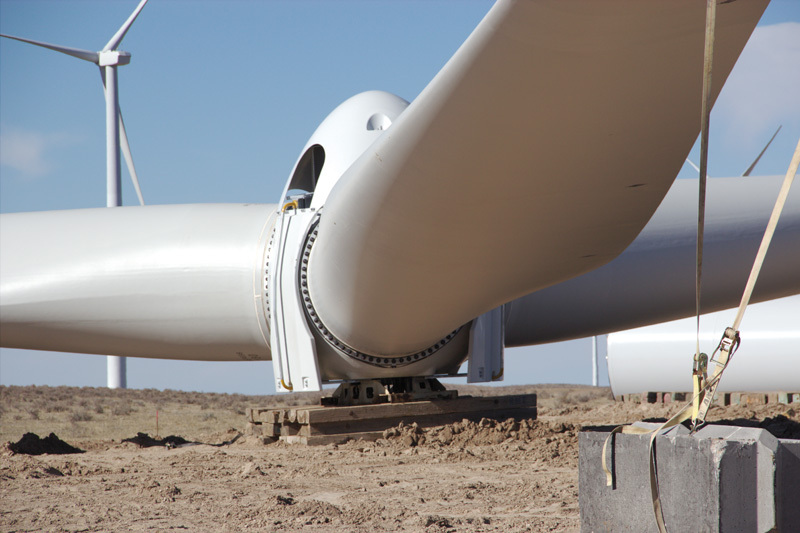 "We issued our first Request for Proposals for wind power back in late 2007, with the idea that we would dip our toe in the water and gain operational experience with renewable resources, while making progress toward recently enacted renewable portfolio standards in New Mexico and Colorado," says Susan Hunter, Tri-State's business development manager. "We were working on who we were going to pursue PPAs with, then the financial crisis hit in 2008, and that delayed our efforts a bit. "But we picked back up and were able to sign two PPAs in 2009. That was our first foray into renewable resource procurement." Both projects were constructed and completed in 2010. Through a PPA, Tri-State is involved in one of the largest PV solar power plants in the U.S., the 30-MW Cimarron solar plant in New Mexico, which is jointly-owned by a partnership between utility giant Southern Company and Turner Renewable Energy. On the wind side, the utility has a long-term PPA for output from Duke Energy's 51-MW Kit Carson wind power project in eastern Colorado. While there has been increasing interest in renewable energy by Tri-State's 44 member cooperatives and public power districts, Tri-State's initial involvement in renewables was to meet compliance obligations, in the form of Renewable Portfolio Standards in New Mexico and Colorado and to gain operational experience with intermittent renewable resources. Having had success with the Cimarron and Kit Carson projects, Tri-State decided to issue another RFP in late-2011. "The rationale behind that was twofold," explained Hunter. "Part of it was continuing to make progress towards meeting the RPS obligations for our members in Colorado and New Mexico, but the larger driver was hoping to procure competitively priced power for Tri-State's members. "The Production Tax Credit and Investment Tax Credit for renewable energy made the pricing very attractive," says Hunter. "The pricing for wind power had come down significantly from when we issued our first RFP, and we wanted to take advantage of that because the PTC was expiring at the end of 2012." The Colorado Highlands Wind project was attractive to Tri-State for a few reasons including, as mentioned, that Alliance Power already had an interconnection agreement in place with the Western Area Power Administration (WAPA). Tri-State, incidentally, has long been involved with WAPA for another source of renewable power, some 625 MWs of hydropower. Hunter noted that other proposals did not have interconnection agreements in place, and getting these agreements can take some time. "That was a big piece of the puzzle that was already in place for the Colorado Highlands Wind project. The interconnection agreement was a big advantage. "Transmission capacity is one of the big challenges for the industry," she added. "Transmission capacity is getting scarcer for utility scale renewable projects, certainly on our system and in this region." Having a site with a great wind resource is one thing, but having a site with a great wind resource and access to transmission facilities puts a project in another league. "We received bids from companies that had not even initiated the interconnection application process, which is the very first step in what can be a very lengthy process. And there can be uncertainty with that; if they are not far along in the interconnection process, there are some risks going ahead with a PPA, if the results of studies are not favorable or if the results of the studies affect the economics of a project." The Colorado Highlands Wind project is also in a very wind-rich area, the far northeastern part of the state, near the state boundary with Nebraska. It is actually located in the service territory of one of Tri-State's member cooperatives, Highline Electric Association. Tri-State also liked the fact that the project had the backing of GE Energy Financial Services, which co-owns Colorado Highlands Wind with Alliance Power. "We knew we had a credible counterpart, and that's important to Tri-State," said Hunter. "We want to be contracting with someone where there is a high likelihood of the project moving forward successfully and being operated professionally throughout the term of the agreement." They needed the project to move forward quickly, says Hunter. The RFP was issued in October 2011, with proposals due in November and selections made in December. PPA negotiations began early in 2012. The expiry of the PTC was looming at the end of 2012, though it was later extended in early-2013. "We knew that some of the big pieces of the wind project puzzle had to already be in place, that we'd be negotiating a power purchase agreement in the January/February timeline." Tri-State needed the selected wind project developer to hit the ground running-and have the wind farm up and operating by the end of 2012. Fortunately, Alliance Power already had many of the pieces in place for the Colorado Highlands Wind project. Jim Michael, president of Alliance Power and the managing member of Colorado Highlands, says work had started on the site back around 2005. "Met towers were installed then, and some folks had done some early stage land acquisition and data collection that we were able to benefit from," explained Michael. "We and some investors acquired those development rights and essentially acquired the project. We continued on with more development activities, in terms of interconnection, permitting, avian studies, cultural studies, and economic analysis." When Tri-State issued their RFP, Alliance Power was able to respond with a well developed project-and won the RFP. Then the real work began, with a very short timeframe to meet the PTC deadline. "It was very challenging," says Michael. "We were probably one of the last PPAs executed for that cycle of the PTC-we signed the agreement with Tri-State on February 28. We had done the planning and were in a position to proceed, but you really can't execute the contracts for construction or buy turbines until you have that PPA in hand." The 67-MW Colorado Highlands Wind project was attractive to Tri-State Generation and Transmission Association for a few reasons, including that Alliance Power already had an interconnection agreement in place with the Western Area Power Administration (WAPA). Other proposals did not have interconnection agreements in place, and arranging these agreements can take some time. In addition to the wind turbines, there were longer lead time components, such as transformers and high voltage circuit breakers. "We really had to use the best of our capabilities and experience in the EPC area, but we have that background, so we were able to put together a schedule that we were then able to follow through on and achieve." Being prudent, they had contingency plans, says Michael. "We had a Plan A, a Plan B, and a Plan C-but we didn't even need to go to Plan B. We were able to get everything done as we had planned it. But resources were tight, turbines were tight, cranes were tight. "Since we were one of the last-if not the last-PPA to be signed that year for the PTC, rolling out of that we were one of the last to receive equipment on the project site. But we were able to work with both our contractors and turbine supplier GE to try and accelerate deliveries of equipment and construction, wherever possible." RMT Inc. was selected to be the EPC on the project. Though Alliance Power had not worked with RMT previously, they were confident of their ability to deliver. As of February 2014, RMT was rebranded as IEA Renewable Energy. The renewable energy group at IEA also includes White Construction Inc. Together the IEA family has built over 10,300 MW of wind power and more than 340 MW of solar power. RMT provided the civil and electrical infrastructure to support the installation of the 42 GE 1.6-MW wind turbines at the site, including roads, crane paths and pads, and turbine foundations. The electrical infrastructure included a 34.5/115-kV power substation; a 6.2-mile 115-kV project transmission line; and interconnection switchyard to the WAPA system. RMT was also responsible for tower erection, in-tower wiring, mechanical turbine completion, operations and maintenance building construction, and testing and inspections to deliver a fully functional wind-powered electrical generation facility. "RMT did an outstanding job," says Michael. "They really understood the challenges we had and the milestones they needed to meet in terms of interconnections, getting the turbines up, and getting through mechanical completion, start-up, and commissioning. "They understood the value of every day and every night-we were doing some turbine erection at night-to the construction schedule." From the start of construction, they had the project up and running in 229 days-by December 6-which was their commercial operation goal date. "It came together on schedule and on budget, but it took continuous oversight to make sure nothing was falling between the cracks." And it took a lot of hard work, says Michael. The construction crew took Thanksgiving Day off, but other than that, it was a full-court press towards completion. Since the project was interconnecting with WAPA, which is a federal agency, Alliance Power had to meet National Environmental Policy Act guidelines for Colorado Highlands. Being a smaller site, about 6,640 acres, Alliance Power only had to do an environmental assessment, and not the environmental impact statement that a larger project would require. "The environmental standards were still rigorous, though. We had three years of avian studies, bat studies, and cultural studies. We worked with the federal agencies to meet all the NEPA requirements." Michael added that it was pretty close to an ideal site, with no water or wetlands, little avian activity, and no eagles in the area. 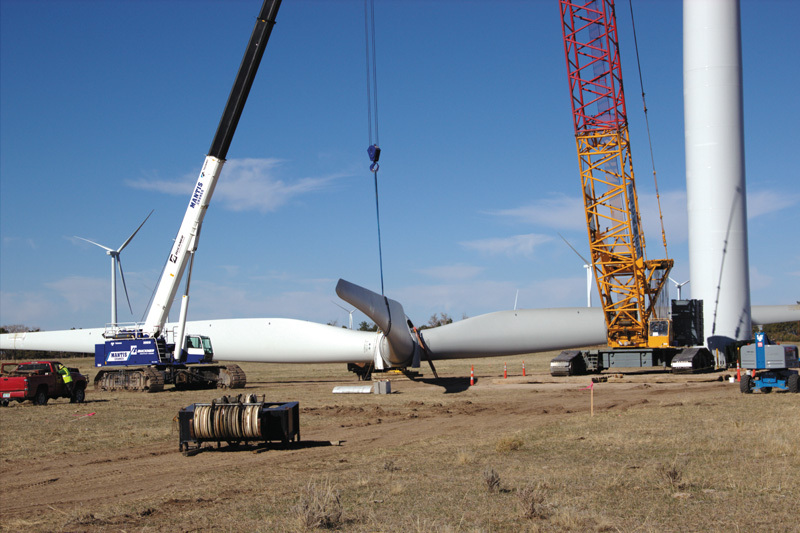 During construction, RMT worked with Alliance Power to minimize wind days. "RMT were fantastic in terms of minimizing wind days. They were flexible and cooperative and shifted the schedule so it was safe to fly rotors up or top turbines." Every project, Michael noted, has its challenges, big and small. "They had one turbine blade that was damaged and required some minor repairs. It meant the crane had to walk by that particular turbine-once it walks past, it continues on, and it's a long walk back. But you can't speed up a blade repair that is going to take three or four days-resin has to dry properly. So we had the crane walk back at night, and that helped with any loss of production time." As noted, phase one of Colorado Highlands consisted of 67.2 MWs, but Alliance Power built additional capacity into the interconnection and infrastructure, and when the PTC was extended in early-2013, they approached Tri-State about including another 23.8 MWs in the PPA-and Tri-State agreed. Another 14 GE 1.7-MW turbines were added to the project. "We solicited competitive proposals from contractors, and RMT, with their experience at the site, was able to step in," says Michael. "They gave us a cost-effective price, went to work on the project's second phase in June 2013, and wrapped things up in September." Michael noted Alliance Power treated the two phases of Colorado Highlands as two separate construction projects. "We had a laydown site, construction yard, and on-site construction batch plant, and the ranchers and the local community wanted the project wrapped up for the first phase and the roads restored and the land re-vegetated. So at the end of phase one, we put things back as good as new. "When June came around the following year, and the pieces had fallen into place and Tri State wanted to proceed with another phase, we came back and re-established some of the construction facilities. In the scheme of things, that was not a trivial cost, but it was the best way to approach it from a management perspective." While there was an upfront investment by Alliance Power in gaining the interconnection agreement with WAPA, it really proved to be key in being awarded the RFP and completing both phases of the project quickly and professionally, says Michael. Doing their homework meant the company was able to present and deliver a well-planned, well-designed, cost-effective project to Tri-State. The investment community also looks for those attributes in financing projects, says Michael. "I really think you need a well planned project so you minimize their risks," he says. "You want to have the permitting properly completed and documented and have a first rate contractor building to a design that meets industry standards. And you want to have a plan of execution that allows the contractor to minimize their risks, because if you put unreasonable requirements on the contractor, that is going to be reflected in their bid price, which ultimately reflects on you being able to deliver on the economics of the project. "Well-planned projects allow everyone to sharpen their pencils, and that is what it takes to win wind power projects these days." With a further four wind projects in the pipeline, Alliance Power is hoping to do more wind projects in the near future-as is Tri-State and its members. Tri-State facilitates and incentivizes local project development on its members' systems. It has an all requirements contract with its 44 members that gives members the right, but not the obligation, to serve up to five percent of their load with renewable or distributed generation projects the members either own or purchase through a PPA. "Some of our members have been very enthusiastic about filling up that five percent bucket," says Tri-State's Susan Hunter. "We have 15 members who now have, or are pursuing, 38 projects with all kinds of renewable technologies, from 10 kW all the way up to 8 MW." Tri-State also issued an RFP in 2013 to add further renewable resources to their portfolio, which it will likely need sooner than later. In February 2014, it announced that it has entered into a 25-year agreement with a subsidiary of NextEra Energy Resources LLC for a 150-megawatt wind power generating facility to be constructed in eastern Colorado, the Carousel Wind Farm. This will be Tri-State's largest wind energy PPA to date. With all these projects in place or in development, Tri-State was well on target to meet the original Colorado RPS for rural electric cooperatives of achieving 10 percent renewable energy by 2020. But in a controversial and unexpected move last year, the Colorado Legislature passed a bill doubling the renewable-energy target for rural electric cooperatives, to 20 percent by 2020. While 2020 may appear to be a long way off, cooperatives in the state say that it is not just a matter of turning on a switch to get that additional renewable power-and that proper planning is required. Tri-State further believes, noted Hunter, that such mandates are unnecessary and that the not-for-profit cooperative's resource decisions should be directed by its democratically-elected board.